1. NAIA Terminal 1: the main international airport where foreign carriers land, except Nippon Air. 4. 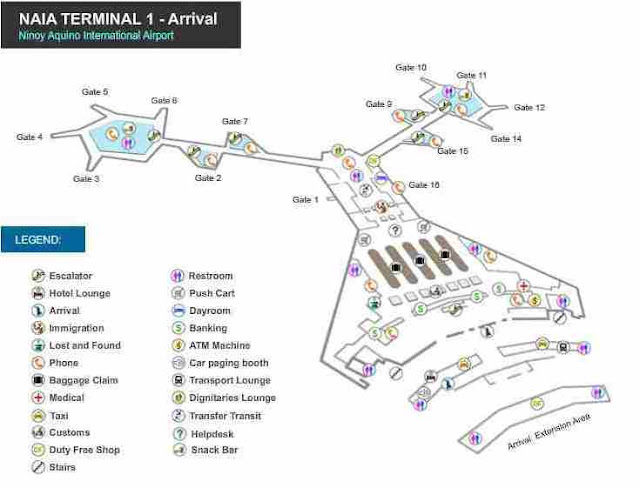 NAIA Terminal 4, or Domestic Terminal: the oldest terminal and the original international airport. It was built in 1948 and currently used by Zest Air and Southeast Asian Airlines (Seair). This is called by the locals as a the Domestic Airport. 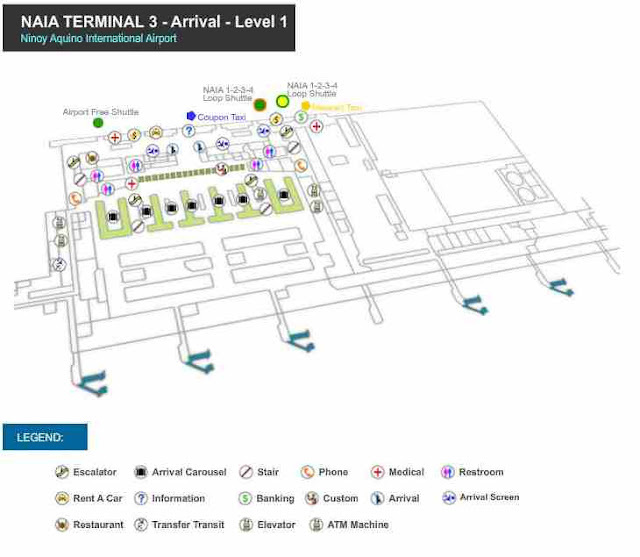 Check out the website of the Manila International Airport Authority for detailed information. 1. After claiming your baggage, you go out the arrival exit gates, and find the metered taxi counter, where you can queue for a taxi. 2. Inform the man on the coupon taxi counter of your destination. Then he will give you a white dispatch slip shown below. 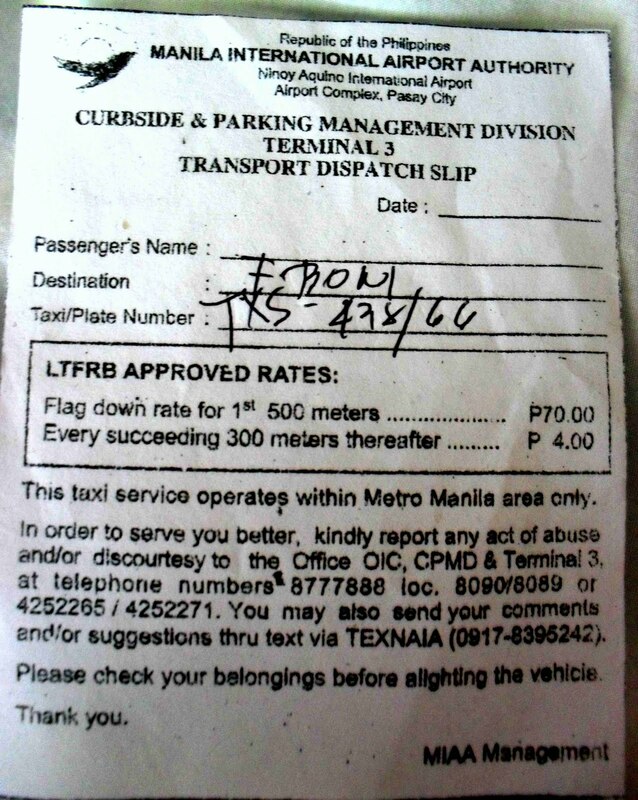 The dispatch slip contains information about your destination and the plate number of the taxi you are riding. 3. Upon riding the taxi, make sure that the taxi driver flags down his meter. Otherwise, if he refuses to do so, get off the taxi and find another one. 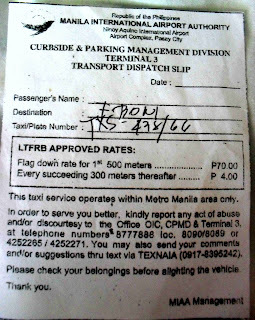 As of April 2011, the trip from the airport to the Fort (Taguig City) or Makati is around P160.00. b. in case you accidentally leave something behind. 2. The moment you ride the taxi, make sure that he puts on the meter. In case he doesn't or refuses to do so, you can easily find another one in the vicinity of the airport. 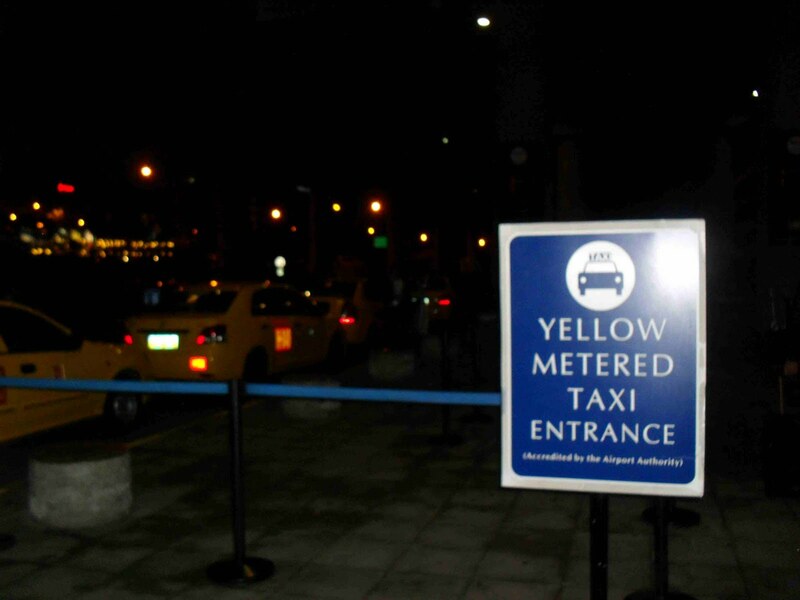 If you wait till you're outside the airport to check, it will be harder to get off the taxi and find another one. 3. 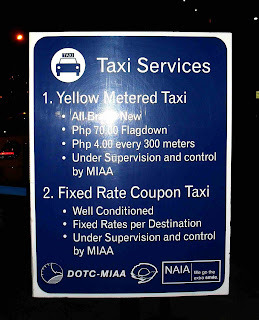 Make sure to have small peso bills with you when riding a metered taxi, to avoid the situation when the taxi driver may not have change for you. Bills broken down into 100 peso bills is good enough. this has been quite helpful post..mertered taxi provide satisfiction whilw payment of charges. 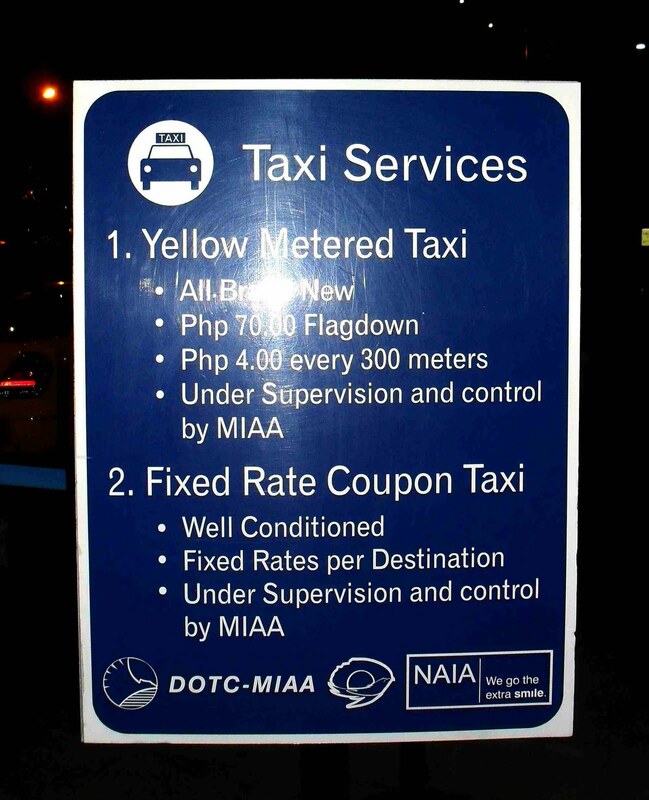 This is really a nice information Its a big problem if you cant get a proper taxi service on airport. 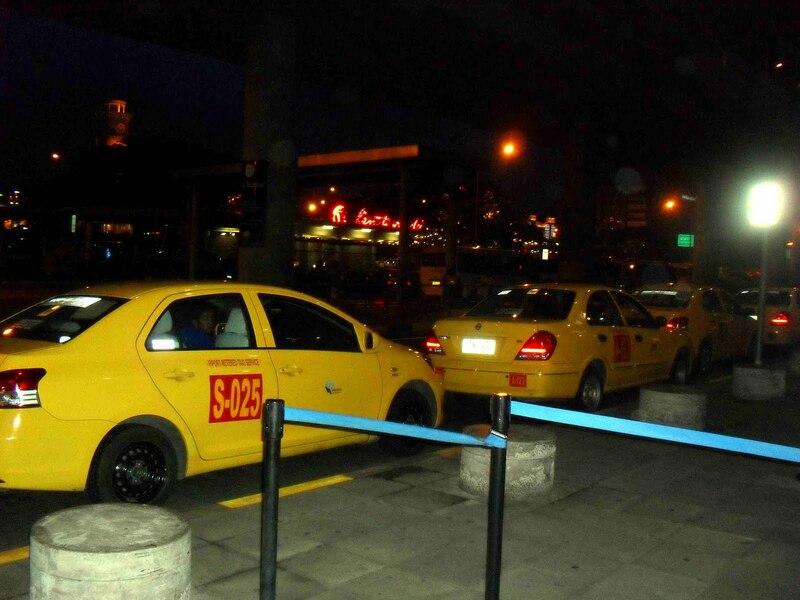 This is really a great post about airport taxi service thanks for sharing it. Impress from maps on this blog, this is the best way for convey to any one. Maps are providing the best way of instruction. Which is best for easily understand the way. Well, It was not to easy to understand without having a map. 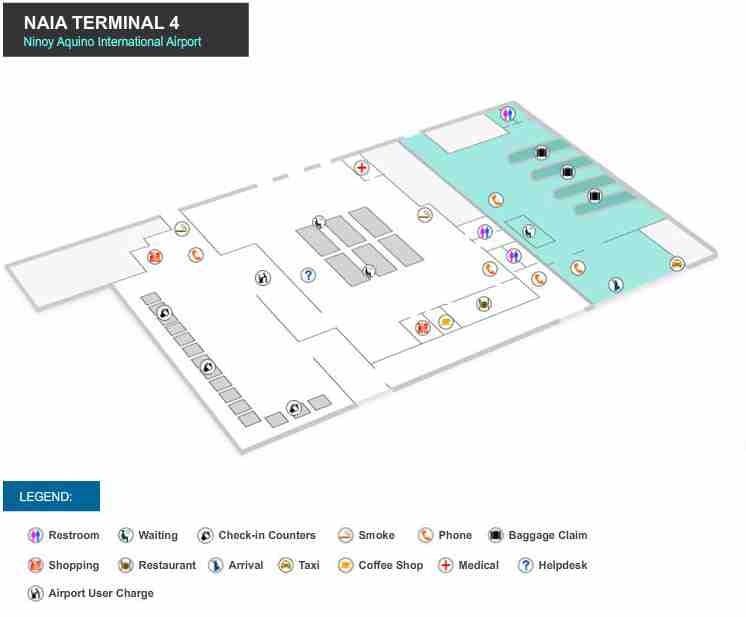 I am thankful to you for posting these great diagrams which made it too convenient. Do you also have park and stay facility nearby if I own a car? 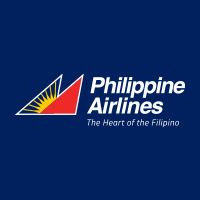 Yes, there's park and fly in manila. 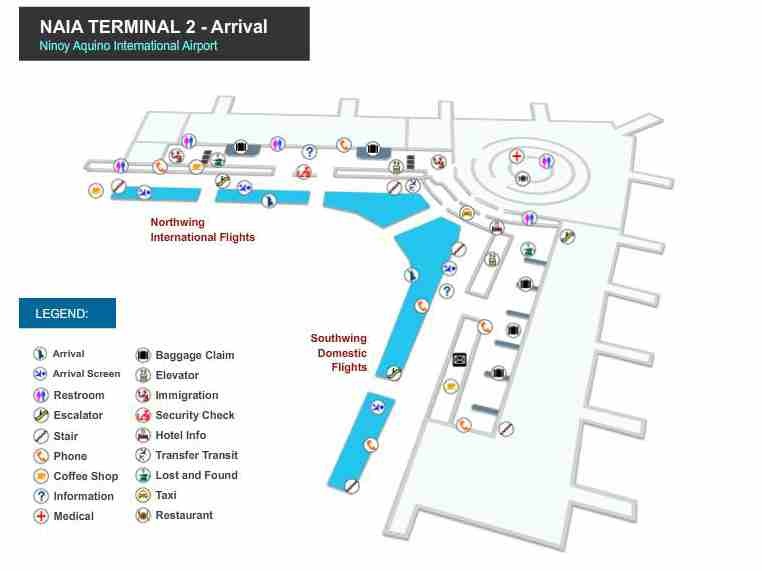 Check out my post at http://www.pinoyroadtrip.com/2010/08/manila-international-airport-transport.html?m=1.